Brands Hatch rogue driver jailed Jump to media player A man who drove his girlfriend's car on to the Brands Hatch circuit during a race is jailed for eight months. 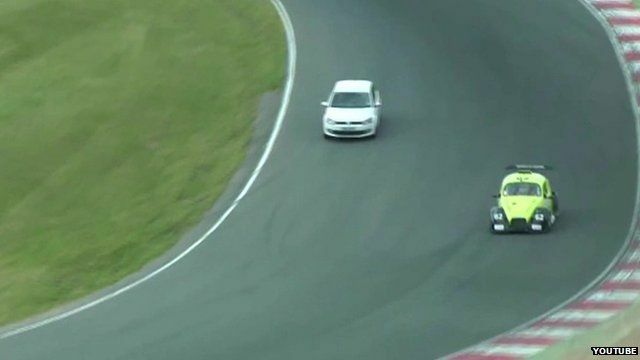 Footage of Brands Hatch rogue driver Jump to media player A 22-year-old man who drove his girlfriend's car on to the Brands Hatch circuit during a race could face jail. A man who drove a car on to the Brands Hatch circuit, in Kent, during a race has been jailed for eight months. Jack Cottle was arrested after footage of a VW Polo being driven on to the track in June was posted on YouTube. Cottle, 22, of East Sussex, who was driving his girlfriend's car, had admitted a public nuisance charge at Maidstone Crown Court. BBC South East Today's Chrissie Reidy reports.